The International Hobbyist: Montana, day 7. Sweetgrass, and skunked. Today I had the honor and pleasure of working with Glenn all day. He was very patient as we milled, glued, and wrapped strips. 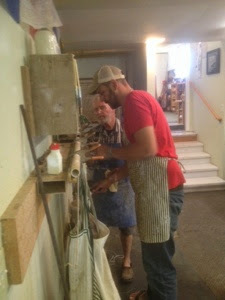 People poked their heads into our working area on a regular basis, mostly just to shake the hand of THE Glenn Brackett, or tell a story or two about a Winston or Sweetgrass rod that had passed through Glenn's hands. He was gracious and genuinely enjoyed meeting these people, despite the interruptions. Earlier in the week I had mistaken one nondescript Sedan for another, and sat in a strangers car, trying to fit my key in the ignition until I noticed that the passenger seat was filled with completely different sorts of junk than the junk in my own passenger seat. Glenn enjoyed this story and relayed it to visitors, as well as my success with carp, which I had hoped to replicate this afternoon on a bamboo loaner rod. As the day went on, Glenn thanked me for "pulling my weight and then some" around the shop, and that meant quite a bit, I know it's a busy time of year and having a curious amateur fumble around the shop doesn't particularly help things run smoothly. It was 3pm before I knew it, and I had a busy afternoon planned. First, back to the Beaverhead with an 8 foot 5 weight rod from the shop and hopes of another carp. Alas, it was not be. I hooked a substantially larger carp than my last one, but he broke me off almost immediately. Likely for the best, I think I would have had a very hard time landing him. I hooked a sucker, but couldn't tempt abother carp, so I left and headed for Notch Bottom on the Big Hole. It was a long, beautiful drive, all for naught. The river was far too high and dangerous to wade. I tried some streamers along the bank, but the current, mosquitos, and lack of any fish action drove me off the river in short order. Back I drove, and decided to try streamers on the Ruby again, only this time with no luck. On my way back to Sheridan, I had a burger, fries, and two pints of Trout Slayer ale amidst dancing cowboys/girls and a playlist of alternating mournful and jingoistic country songs.